How the hell is Johannesburg going to be ready to host the World Cup next year? Turning off the main highway in Johannesburg, South Africa, our minibus taxi is stopped by a police officer at a roadblock. Our driver, a jaunty Zulu-speaking teen sporting a black baseball cap and an ancient plastic armband that might have been a “LiveStrong” bracelet from another geological era, pulls over to the side of the road and rolls down his window. The officer reaches inside, hooks his fingers through the bracelet, snatches the driver out of the minibus, and begins punching him. None of my fellow passengers twitch. “The officer wants a 50 rand ($6.50) bribe,” suggests one, twiddling placidly on his smartphone. It was an inauspicious start to a little experiment I ran to gauge Johannesburg’s readiness to host next year’s World Cup games: “precreating” a tourist’s potential trip from a hotel in the business-chic suburb of Sandton to the Soccer City stadium right outside the famous black township of Soweto, where the World Cup final will be held, and then back to Newtown, an up-and-coming inner-city nightlife and museum hub. I love Johannesburg, but I had been wondering how the hell hundreds of thousands of foreign soccer fans will navigate this violent, chaotic city. 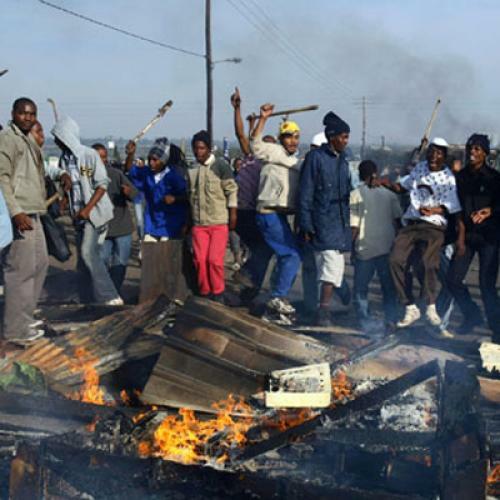 Jo’burg is infamous for car-jackings and home invasions, a security squad nicknamed the “Red Ants” that evicts squatters with crowbars, and urban blight so extensive that most big businesses have fled downtown for the suburbs. The latest trend is the hijacking of entire buildings. Nowhere is the anarchy more epitomized than in Johannesburg’s public transit, a system most World Cup visitors will be forced to encounter. It’s a profoundly decrepit network in which, in a single 30-day span early this year, a bus got stuck in a river, drowning some riders; a drunk bus driver nearly drove his bus off a bridge; and two buses burst into flames on the street. Most public-transit users forgo buses in favor of the ubiquitous “minibus taxis,” which are barely regulated, sometimes un-roadworthy to the point of illegality, and organized into mob-like cartels whose internecine warfare has claimed several thousand lives. Lest you think risking getting caught in a turf war is better than risking getting caught in a toaster on wheels, the day before I rode one, I saw a Johannesburg minibus taxi burst into flames at a stoplight in front of my own car. On my mock tourist’s journey, I brought along Brian Mahlangu, a journalist from Soweto, because hailing the right minibus taxi in Johannesburg demands fluency in a cryptic local sign language: an index finger pointed upwards means “town,” five fingers formed into a cup means “Orange Farm,” and so on. But I also asked him to accompany me because I am afraid of the taxis. I ride them in more relaxed Cape Town all the time, but never here, where a white woman alone sticks out on a minibus. In post-apartheid Johannesburg, the different races still circle each other on separate tracks. And the old public transit routes themselves help ensure it stays that way, as Brian and I see from the start. 10:17 a.m. -- Brian and I leave my car in Newtown and head down Bree Street towards the “Noord” taxi stand, where we’ll take a 5-rand ($0.65) minibus taxi to another downtown stand, then catch a 6.50-rand taxi north to Sandton. Inconveniently, the taxi routes all go through the city center--a legacy of apartheid, when public transit was oriented towards shipping black laborers to work in the city and back to their dormitory towns at night. Turning a corner, we nearly run headlong into a man shouldering an R5 assault rifle. He’s guarding an armored bank truck, which have become a favorite target for gangsters unhappy with the pace of their post-1994 enrichment. Brian skitters across the street. “I don’t even want to be near those guys,” he mutters. “When the thugs come, they only want the cash box, and they’ll just blow you to smithereens, especially with the festive season coming.” I assume he means heists increase around Christmastime, not that thugs consider blowing people to smithereens an essential part of the holiday tradition. 11:00 a.m. -- Our driver gets beaten on the ride north to Sandton. Contrary to my fellow passenger’s theory, the driver reports upon his return to the taxi that no bribe was demanded. Rather, the episode was, perhaps, an exhibit of the South African police’s newfound antipathy towards the taxis. An early black industry that flouted apartheid’s laws against black-owned businesses, minibus taxis in South Africa were long an untouchable political force. They had liberation cred, and the liberator government hesitated to interfere with them--or to push new public transit infrastructure that would threaten their business. But no more. As it is in many sectors here, there’s a growing feeling that, 15 years after liberation, it’s time to put aside sentimental things. The specter of the coming World Cup has triggered an unprecedented investment in public transit, capped by a multi-billion rand, 330-kilometer bus-rapid-transit (BRT) network modeled on Bogota’s. It’s called the Rea Vaya--or “We Are Going” in Sotho, one of the Rainbow Country’s eleven official languages--and it officially opened in August. Fiona Forde, a journalist writing a history of the taxi industry, watched its rollout, and she reports that on opening day--in order to send a message to the taxis that no funny business with their new competitor would be tolerated--“there were as many police on the streets as there were during [2008’s huge] xenophobic riots.” I have even heard that intransigent taxi drivers who try to block the dedicated bus lanes during the World Cup may see their vehicles removed with cranes. 11:20 a.m. --We pass through Hillbrow, Johannesburg’s wildest no-man’s-land, on a 6.50-rand taxi from Sandton back to town. A few ghostly reminders of white Afrikaner rule remain, in the form of old signs in Afrikaans (“Poskantoor”, “Biblioteek”). But most have been plastered over with handmade fliers for African healers (“Prophet Obama”, “Macomputer, King of all Problems”). Johannesburg has become a pan-African city. Brian points longingly towards a street vendor selling one of his favorite continental delicacies: whole boiled sheep’s head split down the middle. I stick strictly to a no-sheep’s-head-before-noon rule, but Brian insists it works wonders on a hangover. 12:15 p.m. -- We arrive at “Fashion Square,” a decaying office district the city recently optimistically re-branded. Johannesburgers didn’t completely get the memo. “From Fashion Square down, on a loop, is the prostitution ring,” notes Brian. It also happens to be a central Rea Vaya stop. The long-term plan is to build 330 kilometers of BRT line from filthy-rich Sandton all the way through downtown to poor Soweto, but presently only 25 kilometers--from the city center to Soweto--are running. The Sandton portion of the route isn’t open yet, and it isn’t clear if it will be in time for the World Cup, either. 12:40 p.m. -- The Rea Vaya is five minutes early! And it costs 5 rand, half as much as a taxi to Soweto! And it’s perfectly gleaming, with soft cloth seats, as pristine as the coaches that transport senior citizens around the Grand Canyon. There are even seat belts. Copious security guards in official reflective vests sharpen the contrast with the ad-hoc, rickety minibus taxis. 1:20 p.m. -- The Rea Vaya doesn’t stop at Soccer City today, so we double back in a 5-rand taxi to Soweto’s new mega-mall, where we get on the wrong minibus towards the hospital. As they tend to, the taxi stops have changed without notice, foiling even Brian. 3:30 p.m. -- In yet another 9-rand taxi, we roll past our final destination: the beautiful Soccer City stadium, which was designed in the shape of an African calabash gourd. Since there’s no game on today, getting off would require a special request, and there’d be no sure way home. So we ride straight through to Newtown, where a thirsty soccer fan could retire for a brewski at the World of Beer. But there are hotels all over sprawling Johannesburg. The city itself needs to be navigable; soccer fans don’t just move back and forth along pre-set axes like foosball dolls. Any tourist would be impressed with the Rea Vaya, but with months to go to kickoff, it took us eight additional taxi rides to get where a tourist might reasonably want to go. And anticipating the patterns of public transport use has never been Johannesburg’s strongest suit: Transport to and from the stadiums was the biggest black mark on last June’s trial-run Confederations Cup. I have visions of German spectators, brimming with I-told-you-sos, smugly blogging the beating of their minibus-taxi drivers next June. On the other hand, the ten-year plan and its early Soweto focus make me optimistic that Johannesburg’s bus-rapid-transit system isn’t just for the benefit of soccer tourists. Introducing a BRT into the minibus-taxi mix marks a coming of age, a significant transition of one of South Africa’s strangest apartheid-born fixtures towards a more universal urban solution. This was made possible by the pressure of the World Cup. I reflect, too, on my ride through Hillbrow--a neighborhood I might not have seen any other way than passing through on a public transit route. According to the Rea Vaya’s planners, this is one of the BRT’s chief goals in Johannesburg: making public transit sexier to draw in new riders, while--by doing away with that apartheid legacy of the center-city transfer--decoupling its association with going to work. That way, it could begin to connect communities now divided by location and class. With its off-peak service and its security guards, the Rea Vaya could eventually give a teenager from Sandton going to a party in Soweto a reliable, direct link home at the end of the night. South Africans are always searching for that magic that will make the 1994 dream of real racial integration a reality. The BRT isn’t the whole potion, but it’s an ingredient. Eve Fairbanks is a South Africa-based fellow at the Institute of Current World Affairs and a frequent contributor to The New Republic.